Lenalidomide (CC-5013) is a TNF-α secretion inhibitor with IC50 of 13 nM in PBMCs. MM1S were treated with AT9283 (0.125 μM), lenalidomide (2 μM) or combined therapy for 72 hours. Annexin/PI staining show increased apoptosis associated with caspase 8 and PARP cleavage after 18 and 36 hours of exposure. Pomalidomide inhibits LPS-induced TNF-α release with IC50 of 13 nM in PBMCs. MM.1S cells were cultured with Len (lenalidomide) or Pom (pomalidomide) for 48 h.
Necrostatin-1 is a specific RIP1 inhibitor and inhibits TNF-α-induced necroptosis with EC50 of 490 nM in 293T cells. Cytosolic extracts or nuclear extracts were examined by Western blot analysis using Abs against p105/p50, p100/p52 and phospho-p65. Solid arrowhead indicates a non-specific band. A nuclear marker, PARP, and cytosolic marker, b-tubulin, were used to assess the purity of each fraction. Cambinol is a novel uncompetitive nSMase2 inhibitor with a K i value of 7 μM (IC50 = 5 ± 1 μM). Nec-1s is a stable variant of Necrostatin-1. It is a more specific RIPK1 inhibitor lacking the IDO-targeting effect, with >1000-fold more selective for RIPK1 than for any other kinase out of 485 human kinases. GSK'963 is a chiral small-molecule inhibitor of RIP1 kinase with an IC50 of 29 nM in FP binding assays. It is >10 000-fold selective for RIP1 over 339 other kinases. Cepharanthine is a biscoclaurine alkaloid inhibiting tumor necrosis factor (TNF)-α-mediated NFκB stimulation, plasma membrane lipid peroxidation and platelet aggregation and suppressing cytokine production. 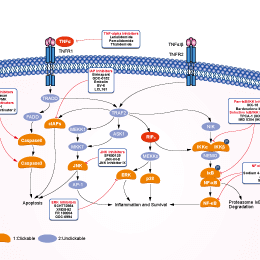 GSK2982772 is an ATP competitive receptor-interacting protein-1 (RIP1) kinase inhibitor with the IC50 value of 1 nM. It has exquisite kinase specificity and excellent activity in blocking many TNF-dependent cellular responses. GW4869 is a neutral, noncompetitive inhibitor of sphingomyelinase (SMase) with an IC50 of 1 μM. It is selective for N-SMase, and does not inhibit acid SMase at up to at least 150 μM. GSK481 is a RIP1(Receptor Interacting Protein Kinase1) inhibitor. Inhibition of RIP1 has been shown to hinder cell necrotic death.